This memorial was unveiled in Rhyl’s Garden of Remembrance in 2015 in honour of Franciscus de Roover, a Belgian who died “broken hearted” in Rhyl after fleeing from German occupation of his homeland. The town sheltered more than 50 refugees during the First World War. 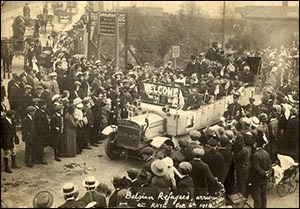 In 1914, c.250,000 Belgians came to the UK seeking refuge when their towns were bombarded by German forces. In Aarschot, in the Flanders region of Belgium, more than 170 civilians died. Most were executed in revenge for the shooting of a German colonel. Some historians believe he was killed by his own side because there were signs of mutiny among his men. Franc de Roover was a widowed clog maker in Aarschot. He was held prisoner by the Germans for a time. After his release, he travelled with his family to Rhyl, where they were housed at 2 East Parade by the town’s refugee committee. Franc never truly recovered from the atrocities he had seen in Aarschot. He died in Rhyl on 19 February 1915. He was found by his 13-year-old son, Marcel, who tried in vain to wake him. Franc’s inquest established that he died from “mental worry and exhaustion, following shock”. Newspapers described him as “The Broken-hearted Belgian”. He is buried in a common grave in Maeshyfryd Cemetery, Dyserth Road, Rhyl. The refugee committee paid for his funeral. 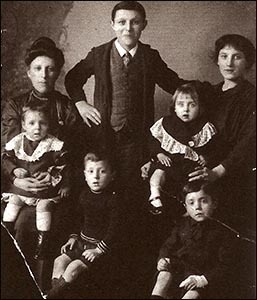 The group photo (right) shows his family soon after his death and was sent to relatives anxious for news. The committee had worked hard to raise money to furnish the house in East Parade and provide food and clothes for the refugees. They were assisted by the Sisters of St Mary’s Convent School. Initially 22 refugees arrived in Rhyl. A further 30 arrived the following week. On arrival, they were welcomed at the railway station by thousands of people (see photo, left). Soldiers from the newly formed North Wales “Pals” Brigade lined the High Street in the refugees’ honour. Local children handed over bags of sweets decorated with ribbons and waved banners and flags they had made. The council chairman, Councillor F Phillips, gave a speech of welcome, and the Rhyl and Potteries Motor Company provided a charabanc to take the refugees from the station to their new home.